Secure Data Technologies is proud to partner with Silver Peak, to help you find the perfect broadband and hybrid WAN solutions. With a fully integrated solution, Silver Peak combines high-performance SD-WAN, WAN optimization, routing and a stateful firewall to turn your WAN into a business advantage. Lower costs, gain business agility and maintain competitive edge by delivering a superior experience when connecting users to applications using any combination of transport. Geographically distributed enterprises are embracing Software Defined Wide Area Networks at an accelerating pace. Why? Because SD-WANs not only save money, they help businesses make money by increasing business productivity. As more and more enterprise applications migrate to the cloud, backhauling that traffic from the branch to headquarters doesn’t make sense. End users often find their business apps run faster over their home Internet service or even on their mobile device. Silver Peak helps enterprises flexibly and securely connect users to applications via the most cost-effective source of connectivity available. 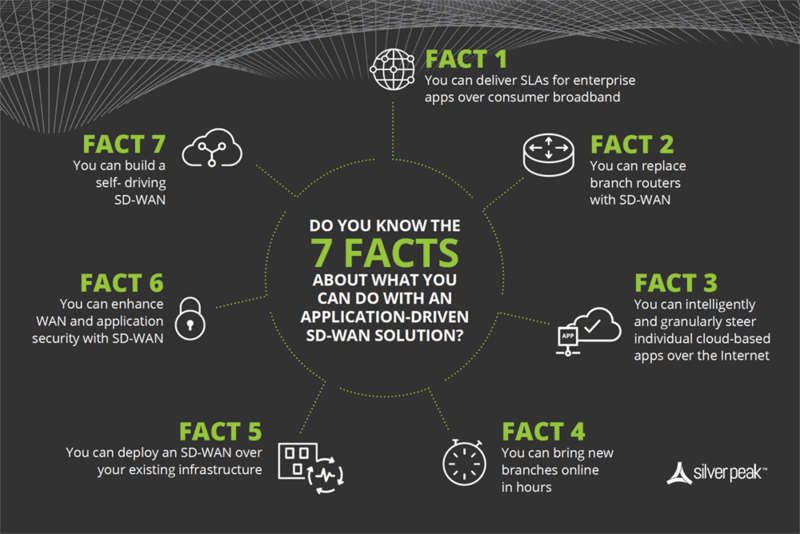 Silver Peak customers can quickly migrate to an enterprise-grade WAN that leverages the Internet (often referred to as SD-WAN), while dramatically improving application performance and lowering networking costs. 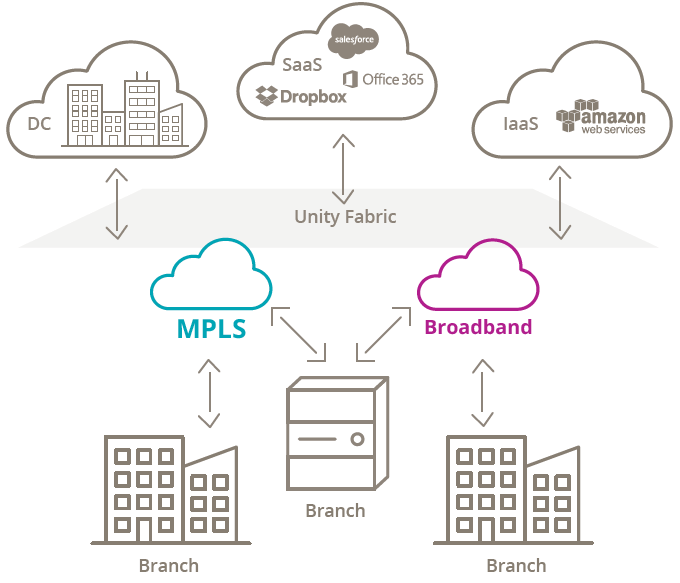 Unity EdgeConnect enables customers to move to a broadband SD-WAN solution at their own pace, whether site-by-site, or via a hybrid WAN approach that combines MPLS and broadband internet connectivity. EdgeConnect provides the flexibility to use any combination of underlying transport technologies without compromising network or application performance to improve business productivity and customer responsiveness while significantly lowering WAN OPEX and CAPEX. 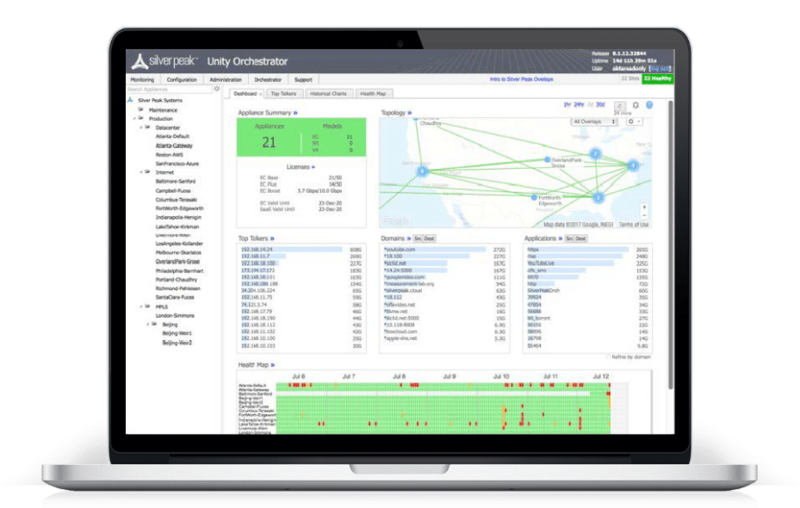 Unity Orchestrator offers unprecedented visibility and control for SD-WAN deployments including both legacy and cloud applications, and the unique ability to centrally assign business intent policies to secure and control all WAN traffic from a single dashboard. Unity Boost is an optional performance pack for Unity EdgeConnect deployments. 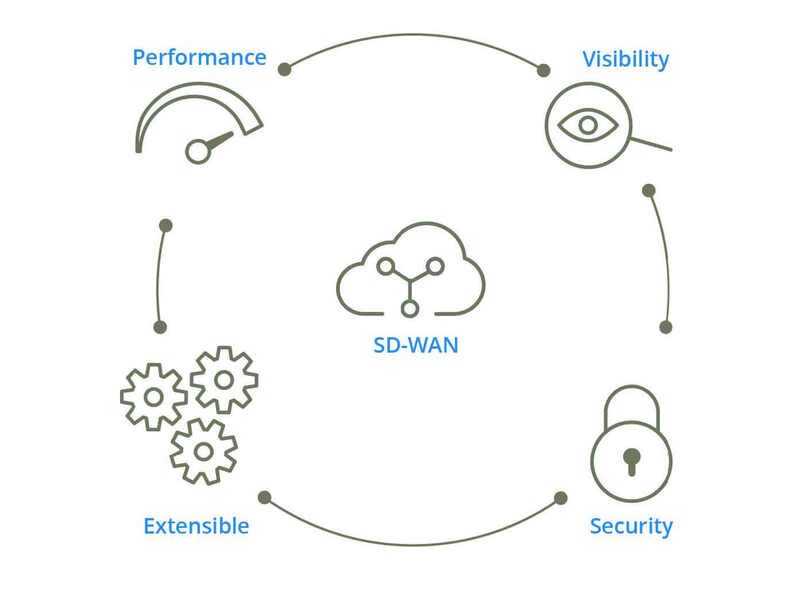 When branch offices are deployed as part of an SD-WAN or hybrid WAN, customers may require higher performance for specific applications, for example, accelerating replication data over distance for disaster recovery. With a click of a button, customers can subscribe to Unity Boost and add application performance as needed. Silver Peak NX appliances are the industry’s highest-performance WAN optimization solutions, supporting up to 5 gigabits-per-second (Gbps) of WAN capacity and 512,000 simultaneous flows. With Silver Peak NX appliances, customers can overcome network bandwidth, distance and quality challenges when moving data over the WAN. Silver Peak VX virtual WAN optimization software combines the cost and flexibility benefits of virtualization with the performance gains delivered by Silver Peak’s industry-leading WAN optimization technology for maximum functionality, including data reduction, path conditioning and traffic shaping. GMS provides all the tools needed to centrally configure, monitor and manage a Silver Peak WAN deployment including advanced application classification, and detailed performance metrics.